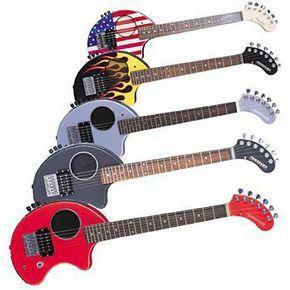 Fernandes Guitars is a Japanese guitar manufacture founded in 1969. They derived from building flamenco guitars, as the company grew, they eventually expanded products to include: additional acoustic guitars, electric guitars, bass guitars, amplifiers, and accessories — Fernandes Guitars ultimately became one of the biggest guitar manufacturer in Japan. With its Nomad Standard, Fernandes managed to pack a speaker and five-watt amp into a tiny, bean-shaped guitar body. Designed as a self-contained electric travel guitar, the Nomad Standard offered all the benefits of full-size models in a compact and portable package. Fernandes must have a miniaturized ray in its factory, because the Nomad Deluxe manages to add on a 24-patch effects processor and an auto-chromatic guitar tuner. The result could be the world’s most versatile travel guitar—one that can easily make the transition from bedroom to studio to stage. The Nomad’s body (what little there is of it) is machined from hardwood laminate. In addition to being cleverly shaped to hug your knee, the body balances perfectly well for strap-on action. The bolt-on neck features some substantial, tidy frets as well as a headstock that could have been designed by the cartoon-making folks over at Hanna-Barbera. You’ve got to appreciate a peghead so blobulent that it leads the whole guitar a unique wide-angle, baby elephant look. Planted along its fat curves are some solid sealed machine heads and an accurately filed graphite nut. The Nomad’s 24 factory effects presets offer a rack’s worth of multi-dimensional sounds ranging from brutal to ambient. Among the many effects are chorus, compression, delay, distortion, doubling, flanging, fuzz, reverb, overdrive, wah, phasing, pitch-shifting, eq, amp emulations and even an acoustic guitar simulator. An easy-to-read LED shows which bank, patch and effects are active, and a handful of switches are provided to help scroll, edit and store patches and effects parameters. It only takes a few minutes to get familiar with the system and its editing process. Up to nine of the 24 effects can be used at once and stored in any of the 24 patches. Simply select a preset, press the edit button and move sequentially through the seven effect blocks. Each block allows you to scroll through a series of preset parameters (all of them clearly tabulated in the manual) and select the one best suited to the tone you want to create. After tweaking through the chain, you can store the results. Should you ever decide to revert to the original factory presets, a few simple maneuvers will return the multi-effects unit to the factory specifications. Although the Nomad Deluxe features a built-in speaker from which to blast its effects, the guitar also has an output jack that gives you the option of listening in private via headphones or plugging the Nomad into an amp. A second jack allows you to hook up a footswitch for hands-free bank switching, or an expression pedal to make full use of the wah and pitchshifting effects. And because the Nomad Deluxe is, in essence, a travel guitar, Fernandes has equipped it with onboard 9-volt power. They’ve also quite thoughtfully provided an AC-adaptor socket (adapter included), for those moments when you run out of batteries. Despite its dinky dimensions, the Nomad Deluxe has easy action and a full-scale neck, allowing it to play an easily as any full-bodied electric. Both liberating in its portability and inspiring in its wealth of effects, the Nomad Deluxe is one outspoken little axe that could well make you a one-man Lollapalooza at your next barbecue. The Fernandes Nomad Deluxe can be had at a very reasonable price at MusiciansFriend.com.